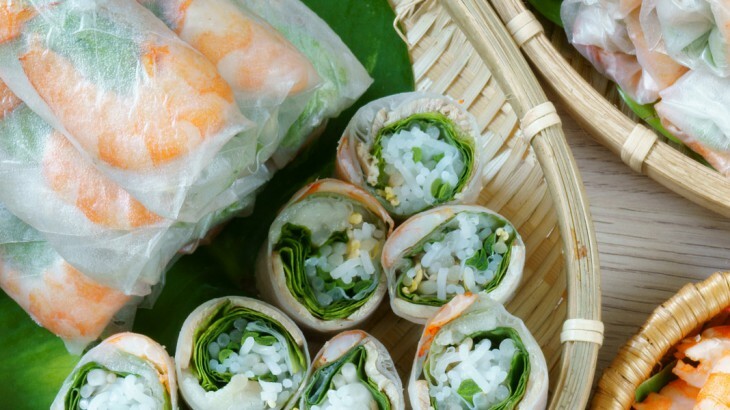 Food is at the heart of Vietnamese culture and Vietnamese food is one of the most popular cuisines in the world as it mixes together a range of flavours and tastes. If you are heading on guided Vietnam tours or are considering a trip to this beautiful country then you have to taste the food to truly understand the Vietnamese culture. Food is not just something you eat, it is a way of life to the Southeast Asian country as the Travel & Leisure website says that over half the population in the country make a living in agriculture or the food market. As a country that loves its food, it is unsurprising that there are a variety of delicious Vietnam dishes that you can taste on your trip and here we have asked some Vietnamese restaurants what dishes they would recommend. The Vietnamese Pho (pronounced fuh) is arguably the most famous dish to come out of the country and is the Vietnamese national dish. It is essentially a delicious rice noodle soup that is served alongside a plate of fresh herbs and now it is a popular meal with millions across the world. 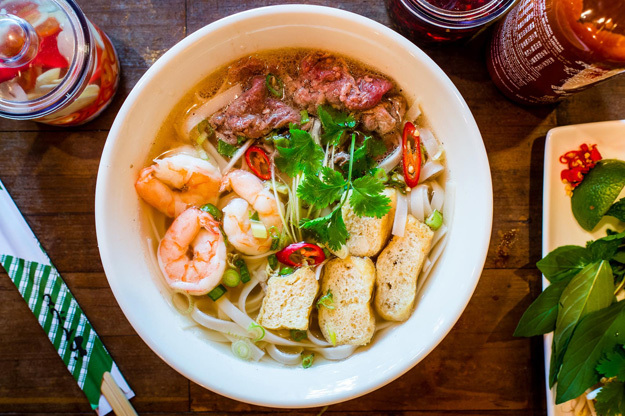 Pho, which is London’s first Vietnamese street food restaurant, recommends this dish – after all it is what the restaurant is named after! “A steaming bowl of phở, brimming with fresh ingredients, aromatic herbs & lean meat is the perfect comfort food & a universal panacea – we think it’s also the best noodle soup in the world!” a spokesperson for the restaurant said. Adding herbs and sauces are also an important aspect of eating phở as they add another something different to the dish, as people can tailor it to their specific tastes. Chilli paste, for example, adds a kick, whilst garlic vinegar adds sourness and if you like a bit of saltiness then just add fish sauce. At Pho, their broths are made by slowly simmering bones for 12 hours as this authentic preparation is key to phở retaining all its goodness and developing its own distinctive tastes & aromas. Oa Com Tam, a Vietnamese restaurant based in London that was set-up by the Nguyen Brothers, recommends the iconic Cơm Tấm dish. Cơm Tấm, a Vietnamese broken rice dish, is one of the most popular dishes from South Vietnam. At Oa Com Tam they offer traditional Vietnamese food and the broken rice dish is no different as it is most commonly served with fresh tomatoes, pickles, sliced cucumbers and dipping fish sauce. 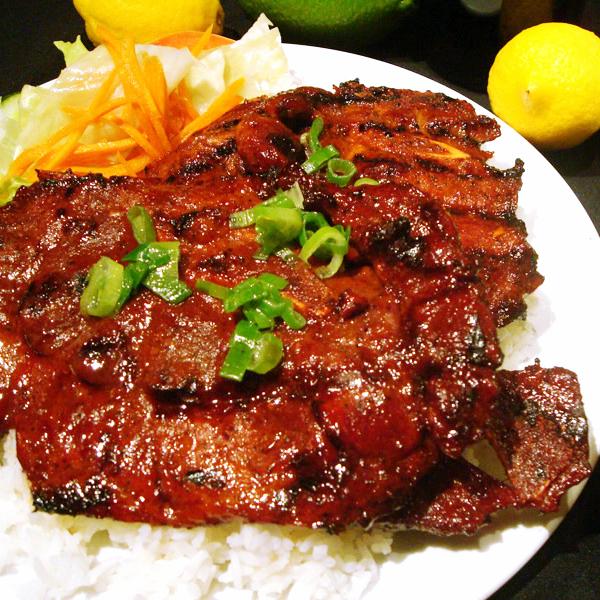 Traditional Cơm Tấm also comes with char-grilled pork chops, a small crabmeat cake and a fried egg. This dish is synonymous with Saigon (Ho Chi Minh City) and you can try it on Wendy Wu’s Vietnam Highlights tour, which visits the city at the beginning of the trip. Being a country with a population of around 89 million means that there are a lot of chefs and one of the most common foods they make is Banh Mi as along with Pho, it is one of the most popular foods you can eat in Vietnam. Whaam Banh Mi, located in Soho, are pioneers in the world of Banh Mi and they highly recommend visitors to try this delicious sandwich. 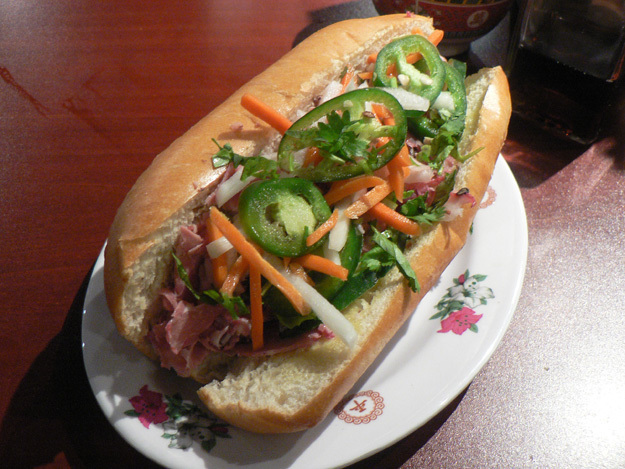 Banh Mi pronounced “bun me” is a particular type of bread that uses rice flour to bring out more flavour. What usually makes up a banh mi sandwich are a meat paté (typically pork), pickled carrot and mooli radish, a filling (often cold cuts) that is topped with coriander, spring onions, chillies and a particular brand of soy sauce called ‘maggies’. Banh Xeo are giant savoury pancakes that literally translate to sizzling cake because of the noise they make when they are being cooked. Banh Xeo is a delicious food and often contain pork, bean sprouts, egg, mushroom and even shrimp. At Vu Viet, a UK-based Vietnamese restaurant, they offer their Banh Xeo with prawns or mushroom and beansprouts. If you are a soup lover then you will be pleased to learn that Bun Bo Hue is another classic Vietnamese dish. 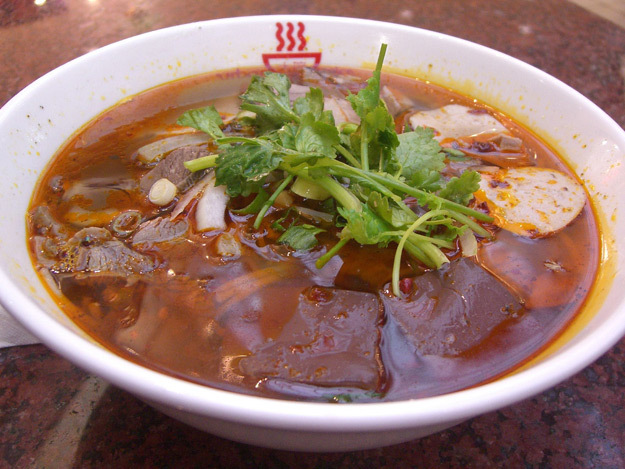 Saigon Saigon serve Bun Bo Hue, which is a spicy rice noodle soup that contains beef and pork and lemongrass. The dish comes from Hue, a central city in Vietnam, and is renowned for its range of tastes; spicy, sour, sweet and salty. This list wouldn’t be complete without a seafood dish as they are some of the standout meals in Vietnamese cuisine. 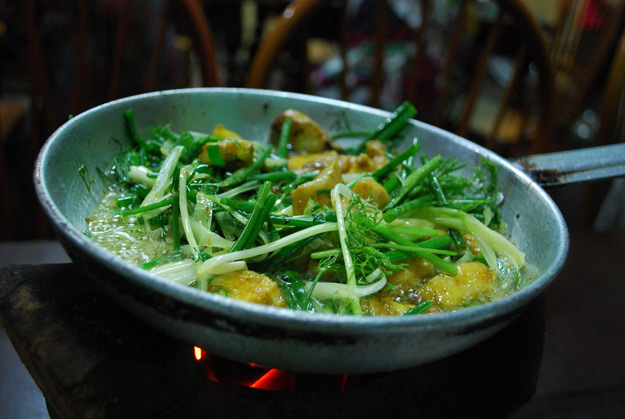 Cha Ca is the most well-known of all Vietnamese seafood dishes. The dish sees white fish sautéed in butter and covered in dill, spring onions and peanuts and to top off this delicious meal it is traditionally accompanied with rice noodles. Mien Tay, a London restaurant that specialises in home-style cooking from South West Vietnam, recommends stewed snakehead fish. The fish is a classic dish from the Mien Tay region. The Mekong Delta runs through the region and sustains an abundance of fish and vegetation, and the cooking reflects these fresh and fragrant characteristics of Vietnamese cuisine. An example of this is using the snakehead fish and caramelising it during cooking using sugar, soy and black pepper. The poussin is marinated in honey and herbs and then cooked on the grill, which results in a tender and deliciously sweet dish with a smoky flavour. Grilled meats are very typical of Vietnam and you will often see Vietnamese families around a makeshift barbecue cooking various skewers and meats. 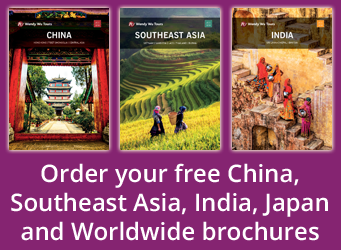 Visit Vietnam, with the UK’s leading Asia Experts, Wendy Wu Tours. Our award winning escorted, fully inclusive tours visit all the major sights of Vietnam for an unforgettable holiday. Vietnam food and drink. permalink.